Join CUESA, the organization behind the acclaimed Ferry Plaza Farmers Market, at The Yard at Mission Rock this fall! 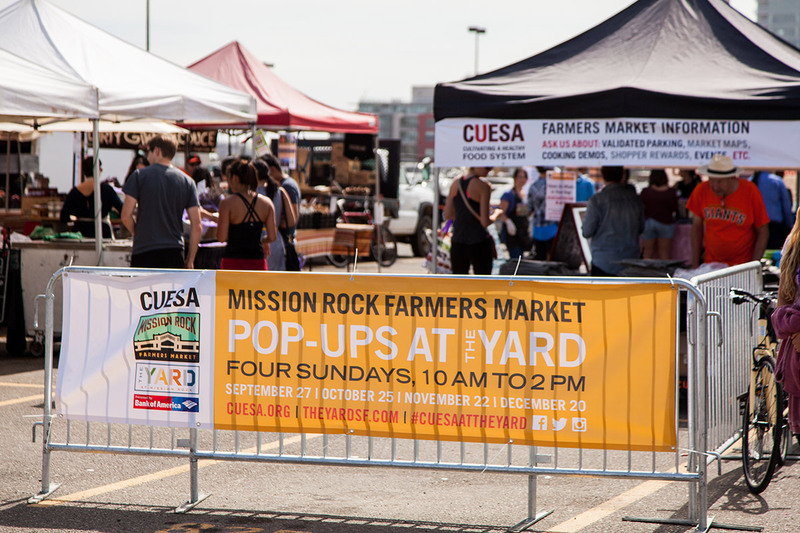 CUESA is hosting a series of farmers market pop-ups at The Yard, across from AT&T Park, in partnership with the San Francisco Giants and Bank of America. The Sunday market will take place from 10 am to 2 pm, with approximately 25 local farms, food crafters, and restaurants. CUESA will also offer fun and educational activities for the whole family, such as cooking demonstrations by local chefs, seasonal produce tastings, and more. Get all your last-minute holiday shopping done at our farmers market pop-up on December 20. Plus, we’ll be featuring holiday-themed demos and activities at the CUESA Classroom, and The Yard will have Christimas trees and free gift wrapping. 11:00-2:00: Drop-in DIY kids craft activities: make your own evergreen decorations (with farmers market dried fruits!) and cards. The Yard is hosting a boutique Christmas tree lot with big and small trees, accessories, and decorations, operated by the Delancey Street Foundation, the country’s leading residential self-help organization. The Yard Christmas Village is a spectacular sight to behold, with decorations and photo opportunities galore. Complimentary gift wrapping services are available from 12-4 pm on weekends. After your farmers market trip, stop by the tented Anchor Brewing beer garden for some holiday cheer. The Yard at Mission Rock is located at the corner of 3rd St. and Terry Francois Blvd., across from AT&T Park. It is accessible by Muni buses 10, 30, 45 and 47, the T-Third Street light rail, and the E-Embarcadero historic streetcar line. Ample parking available in Lot A ($5 for 2 hours for farmers market shoppers). CUESA farmers markets accept EBT (CalFresh/food stamps). Customers can use their EBT card at the CUESA Info Booth to receive market coins redeemable for food at the market. Customers spending EBT at the market can double their dollars (up to $10 per market day) through the Market Match program, which offers free market coins redeemable only for fruits and vegetables.